Last month, I came home from serving in NY, and as great as it always is, I must confess something unusual happens to me when I come home. I crash and become depressed. There, I said it. I haven't been able to completely understands why this happens to me. It seems to vary depending on the circumstances that are present in my life at the time. But when I come home from serving, I have often become depressed, self-absorbed, crabby, and no good to be around. I have spent weeks giving of myself, from the time I get up, to the time I go to bed, and now suddenly, I don't want to. I don't want to give of myself anymore. I don't want to sacrifice for other people. I want to be left alone, to myself, and do my own thing. Again, it seems to vary based on circumstances. I come home to no job, therefore I find I have little motivation to get up in the morning. Without what I perceive to be a meaningful way to give of myself, I become very unmotivated and selfish. Yes, there's my family, but sadly I have discovered that it's often a lot easier to give selflessly somewhere else than it is at home. No, it shouldn't be this way, but that's often how I become. So in my depressed, unmotivated state, I come up with a grand, noble idea. I'll become a hermit! Noooo! I don't want to be a crab! A hermit. I want to be a hermit. Since I don't want to go anywhere or do anything or see or talk to anyone, I'll just stay at home. I'll take the opportunity to read, and study, and spend time with Jesus, and it's gonna be wonderful! If I don't go anywhere and don't talk to anyone, I won't hurt anybody and nobody will hurt me. I will keep to myself, learn and blossom in knowledge and in my relationship with the Lord in the parameters of my two rooms. Oh, just the thought is almost bliss! What could possibly be wrong with this? Here's my confession though. I have never been a happy hermit. At least not for very long. Every time I set out to be a hermit, the excitement is short-lived. But instead of simply becoming sociable again, a raging war ensues. 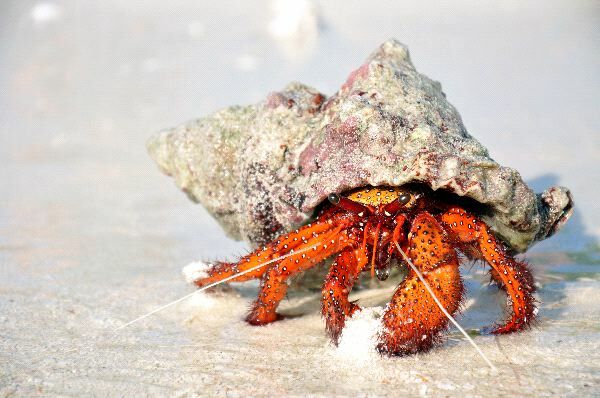 You see, when I make up my mind to become a hermit, it's hard to persuade myself to get out of my shell, even after I know I won't be happy in it. I mean, it can be hard to get out. My mind can conjure up so many great excuses, that I can make sound very legitimate, why it's best to stay home. Alone. I become almost like Gollum and Smeagol, arguing with myself. I can spit out lists of things I could do, time, finances, health, or other clever things depending on the situation. But deep down I know. This isn't for my long-term good. "No man is an island." Ah yes, one of the famous quotes we learn in school. It's true. As much as I would like to convince myself I could live a happy life as a hermit, I need people. There is a risk in opening ourselves up to people, true. But it is needful. We need community. Bad things often happen to people who shut others out. As the body of Christ, we need each other, the church. We need people to come alongside us and lift us up when we're weary. And instead of just focusing on ourselves, we also need to be there for others when they are down and weary. We are meant to bear each others' burdens and encourage each other in our race on earth. When I get into my depressed, hermit-like mood, I have to remind myself of Proverbs 18:1. "Whoever isolates himself seeks his own desire; he breaks out against all sound judgment." Isolating ones self from other people is not wise. Tenth Avenue North recently released a song that speaks on this matter. So take their words to heart. We're not meant to live this life alone. Great post Margaret. Again, by you sharing your experience and offer a new perspective, you have brought me to a new understanding of my own vision and why it is so important to continue to live out my purpose each day, to serve, honor and glorify Him in all I do, everywhere I am. Thanks Margaret.